Lily Allen got married on the weekend, and looked very happy with what turns out to be a double celebration – she’s also pregnant. I really like Lily, especially after watching the Channel 4 series about the shop she set up with her sister. She’s obviously intelligent, very down to earth, and all round awesome. So I wanted to like her wedding dress. The thing is, as separate elements, I liked her outfit. Her dress was very boho cool, and her veil was beautiful. And together they might have worked on a much taller girl, though I’m not sure. It just felt like it overwhelmed her – there was an awful lot of dress and an awful lot of veil and not much of Lily going on. I think had she gone with the same veil, but with a simpler, straight sleeveless dress (flapper style) that showed a bit of ankle, she would have looked awesome. Or if she’d gone with the dress, but had something simpler like a flower in her hair, ditto. Together, I’m just not convinced. Am I off the mark here? What do you think?! 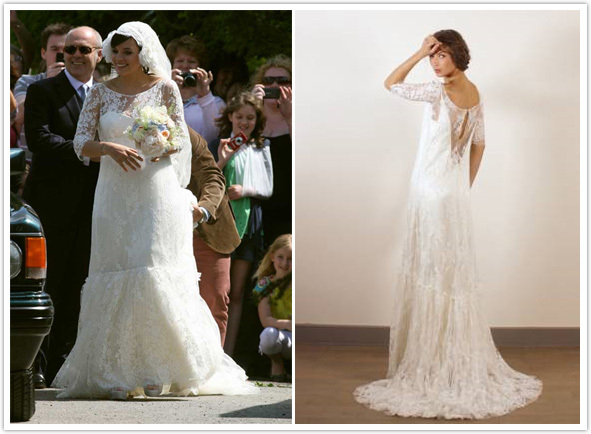 If you want to get your hands on a Delphine Manivet dress like the v. pretty one on the right (Raphael), Browns Bride stocks them. It is sad to say the dress and the veil look awful and I feel you were ‘generous’ in your comments even though you hinted at the same. What a shame! Re the model to the right – is this really the same dress?? If it is then yes it is a beautiful dress … on the model. And it just goes to show how very important it is to dress for your own bodyshape. Also is Lily wearing ear muffs? What is going on there? It has been reported she has since lost her wedding dress. I wonder if this happened after seeing the wedding pics?